First of all Pete went back to school at the age of 21 - can you imagine that? No discos, no late nights, no girlfriends, no soccer matches, no......Don't you believe it; he did all of those things and still managed to find time for school work. At the end of his studies he won a place at Cambridge University where he specialised in metallurgy (what's that?) and gained a Masters Degree in 1979. Not bad for someone who was meant to be no good at maths. After a spell in Dubai working in the petro-chemical industry he decided he needed a change. He dabbled in teaching - loved working with kids and never looked back. After working in several comprehensive schools he became Assistant Headmaster at Cheam School - quite a 'posh school' in Pete's own words (Prince Philip and Prince Charles are both ex-pupils). From the gritty back streets of Rotherham to the leafy suburbs of Berkshire - quite a transformation. Despite his change in surroundings Pete remained a Yorkshireman through and through; down to earth with a great sense of humour. Peter has always been a story-teller and a practical joker. 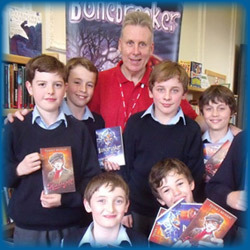 Entertaining pupils with stories of spooky characters and unusual happenings was the ideal breeding ground for the creation for many of the characters who appear in Pete's current novels. To give up the security of teaching in one of the most well-respected schools in the country to become a full time author was a huge gamble for Pete to take, especially when his first book had been rejected by all the leading publishers. Peter self published his first book: Mokee Joe is Coming in 2003. To Pete's amazement his book won the prestigious Sheffield Children's Book Award voted by 112 schools. The rest, as they say, is history. 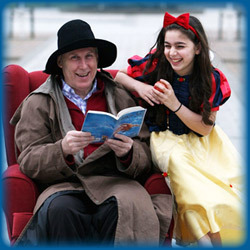 Peter is now one of the UK's leading children's authors and tours schools all over the UK and abroad. He is one of the most sought after visiting authors in schools and is renowned for inspiring children to want to read (especially the reluctant ones). Peter lives with his wife, Kath, dividing their time between their Northern base in Yorkshire and their ‘escape bolt-hole’ in deepest rural Berkshire. When he is not writing or visiting schools, Peter is a keen fisherman and follower of outdoor pursuits…but is always on the lookout for inspiration for his next nerve-tingling novel!